The Pentel Pocket Brush is a responsive tool that’s excellent for location drawing or studio work. The nylon bristles are soft and come to a fine point. More importantly, the brush hairs never splay as you’re working, so the tip is always maintained. The pen accepts cartridge refills and the fade resistant ink is waterproof once dry. I always let the ink dry for a few hours before adding any watercolour washes over top, but it's probably safe after 20 minutes; assuming you're not someplace too humid. When I began to seriously pursue drawing, this portable brush was the only tool of its kind on the market. Nowadays, you can walk into any reputable art shop and choose from a variety of brush pens made by all the major manufacturers. With such a range of products, the quality and price vary. Some of the disposable brush pens will start off with a fine tip, but will lose their point shortly afterwards. Blunt tipped brush pens can be saved for the times when you need to cover broad areas with ink. 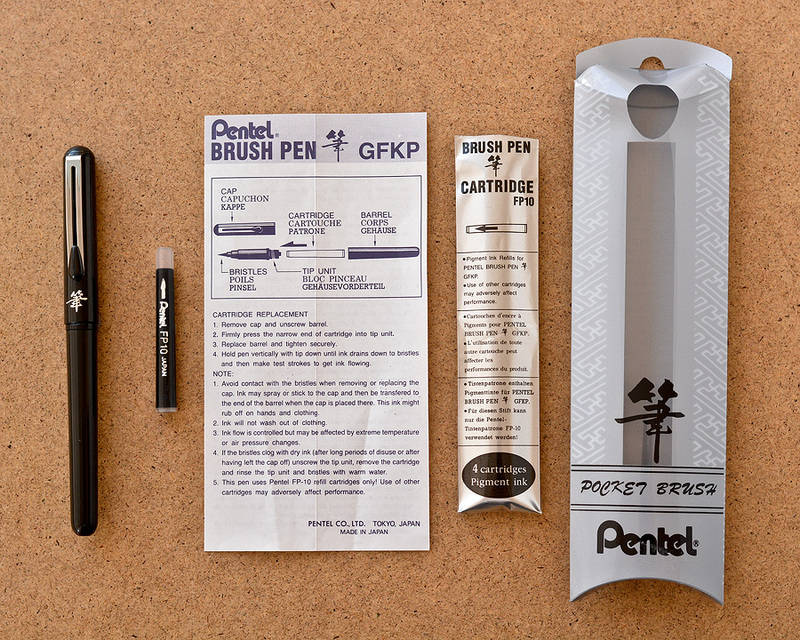 While the Pentel Pocket Brush will cost you more than any disposable brush pen, the brush tip is far better made. If you require a brush pen for limited use, you should be fine with a cheaper alternative. However, for the professional artist, this Pentel brush pen delivers results that are equal to using an expensive sable brush dipped with Indian ink. Plus, you don't have the mess or worry of ruining an expensive brush. If there was one thing I could change, it would be to alter the contour of the rounded barrel so that it has some flat sides. This would help prevent it from rolling off the table and make it easier to grip. Pentel actually makes a disposable pen with such a barrel design. It's called the Brush Tipped Sign Pen and it's very comfortable to hold. The Pentel Pocket Brush is Made in Japan and widely available, so you won’t have trouble finding this product or the ink cartridge refills.